The 60-day, 2014 legislative session is progressing quickly and I'm working hard to help implement policies that will result in lower taxes, less government and more freedom. With many of the same entrenched bureaucrats in power in Olympia, it is an uphill fight but one that I relish. I would love to hear your thoughts and concerns as we try to make Washington state the best place in the nation to live, work and raise a family! 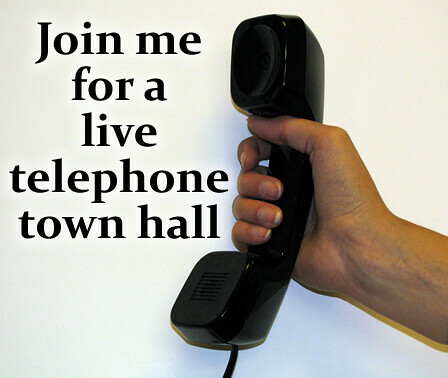 If you are able, please join my seatmate, Rep. Bruce Chandler, and I at our telephone town hall for all 15th District residents on Tuesday, March 4 from 6:30 – 7:30 p.m. Just call toll-free 1-800-291-9241 and you can participate with your neighbors in this “Community Conversation.” These events have been very successful in the past and help us keep in touch with you. You can ask us questions, take our survey or just listen in from the comfort of your own home. I hope you're able to join us. I've introduced legislation this year called the 4th Amendment Protection Act (House Bill 2272) which would help protect our citizens from unwarranted surveillance from federal entities like the NSA. As I told one reporter, if the federal government is going to fail to act to protect our citizens rights, then it is up to the state to take action. For more information on this bill and the media storm it has created, click here, here, here, here, or here. I have introduced other bills to reduce the regulatory burden on our local governments and the private sector, reduce the costs of transportation and other infrastructure projects, reduce the burden on taxpayers while increasing jobs in this state. To read my recent press release on three bills that received a public hearing in the House Environment Committee, click here. Initiative 591 (Protect Our Gun Rights Act) – To find the provisional certification and full language of Initiative 591, click here. Initiative 594 (Background Check for Gun Sales and Transfers) – To view the provisional certification and full language of Initiative 594, click here. I have serious concerns about this proposed initiative as it is the beginning of keeping a master list – a data base – of firearms owners. It also applies to firearms “transfers,” which would make loaning a firearm for hunting or target practice to a friend or family member an illegal act. While I also have concerns about whether or not this proposal would pass constitutional muster, I will most likely not get to vote on it while in the Legislature. However, I can – and will – vote against this measure, just like any other citizen can, if it appears on the ballot this fall. If you want to watch the public hearing on these measures, click here. 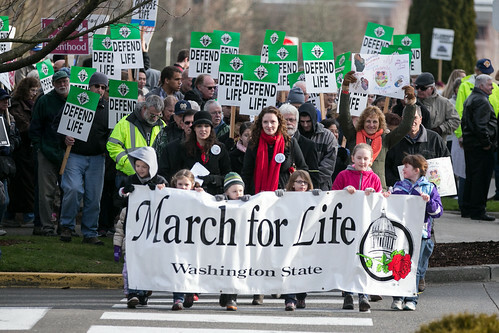 Nothing contrasts the difference between the beliefs and agendas operating in Olympia more so than the fight for the unborn. Early on in session, I stood with fellow legislators and hundreds of citizens at the annual March for Life event at the Capitol steps. Standing up for the unborn is not something I take lightly or will apologize for, even though it may be unpopular with some. I find it disheartening that Democrats in the House yesterday passed the Abortion Mandate bill. This bill says to individuals, employers and health insurers that health plans in our state must include abortion coverage – regardless of their beliefs on abortion. It is anti-choice. It is an attack on religious liberty, freedom and conscience-protections in the U.S. and state constitutions. It would end choice for individuals because it does not allow them to choose a health plan without abortion coverage. This bill says you get one option and no choice whatsoever. Section 507 of the federal Hyde/Weldon Amendment: (d) (1) None of the funds made available in this Act may be made available to a Federal agency or program, or to a State or local government, if such agency, program, or government subjects any institutional or individual health care entity to discriminate on the basis that the health care entity does not provide, pay for, provide coverage of, or refer for abortions. (2) In this subsection, the term 'health care entity' includes an individual physician or other health care professional, a hospital, a provider-sponsored organization, a health maintenance organization, a health insurance plan, or any other kind of health care facility, organization, or plan. I am very hopeful that this bill will die in the Senate. Capitol Report – A three-minute radio program that I do every other week (aired on KARY/KBBO radio) that discusses current issues of the 15th District and the state. Click here to sign up for my RSS podcast. You can also get all of the Washington House Republican Capitol Report programs on your iPhone and iPad through the iTunes store by clicking here. Check out my website – www.representativedavidtaylor.com. From this link, you can get more information about me, the bills I've sponsored and view my news releases. My stepdaughter, Tiffany Stewart, recently visited me in Olympia during “Kids Day” where legislators are allowed to bring their families onto the floor of the House. She looked awful comfortable sitting in a lawmakers chair. She also decided to write up a bill for her culminating senior project to remove the culminating senior project as a mandated state graduation requirement. She convinced a colleague of mine, Rep. Jason Overstreet, to sponsor the bill and it received a public hearing last week! Not bad for a potential stateswoman in the making! To read Rep. Overstreet's press release on the bill, click here. As always, please feel to share this e-mail update with friends and family. And please let me know if you have questions or concerns about legislation or need help with a state agency. It is an honor to serve you in Olympia.